While the investigations and reports which have followed recent health care scandals in the UK have highlighted the very important issue of addressing organizational culture and the need for more effective leadership at every level, patients and their families have struggled to comprehend how such things can occur in a health service that is supposed to be the envy of the world. 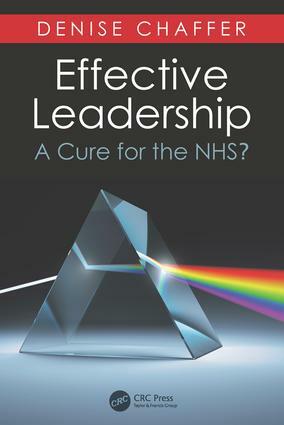 This book has been written to address both the ‘why’ and the ‘how’, in the pursuit of excellence and accountability in health care leadership at all levels and in order to prescribe the most effective treatment for the problems that exist in the leadership of hospitals in the UK and beyond. Based on the principles that underpin ‘good medicine’ in the broadest sense, the text includes detailed assessment, diagnosis, review of the evidence and the application of the experiences shared by a group of senior successful health care leaders. "…can be amply applied to all environments where well-meaning and hard-working nurses and doctors face off with the dilemmas and brutal challenges of caring for the sick … immediate and tremendously useful." Confirming the Diagnosis: What Problems Need to Be Addressed? What Needs to Be Done about Effective Leadership to Help Cure the NHS? Denise Chaffer is a Registered Nurse who has held a range of director posts in a variety of settings for over 15 years, including Acute Trusts and a London Teaching Hospital. She has held a UK wide role with the Royal College of Nursing (RCN) with direct responsibility for 33,000 members, and has significant experience of working at international, national and regional level within acute and community settings, in nursing, midwifery and education, and on major change and reconfiguration initiatives.